Law enforcement officials, pastors, a county commissioner, a doctor, mental health experts, an educator and EMS representatives gathered Friday to take steps to reduce recidivism. The task force was formed after Human Support Services and local officials attended a two-day training session in July to focus on strategic planning to reduce recidivism. Recidivism is the tendency of a criminal to become a repeat offender. 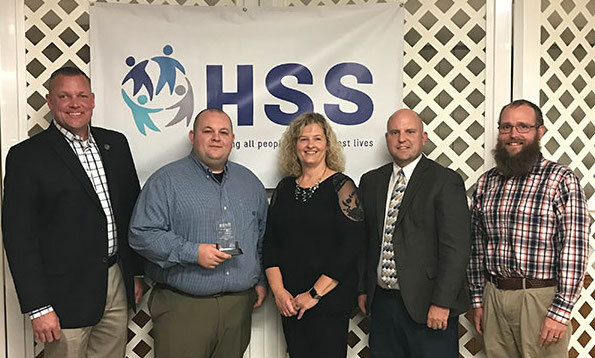 That training occurred because the National Council for Behavioral Health selected HSS, along with the Monroe County Sheriff’s Department, as one of only three nonprofits nationwide to receive that training and technical assistance. The task force will work to provide better, more effective interventions for repeat, nonviolent offenders with mental health concerns or substance abuse problems. This should help prevent recidivism, save taxpayer money and get those with these issues the help they require. The task force is made up of King, Monroe County Jail Supervisor Russell Brafford, Nick Hoeffken of Monroe County EMS, Monroe County State’s Attorney Chris Hitzemann, HSS Clinical Director Adam Woehlke, Monroe County Assistant State’s Attorney Ryan Martin, Monroe County Sheriff’s Department Chief Deputy Jim Lansing, Monroe County Commissioner Vicki Koerber, Monroe County EMS Director Carla Heise, Waterloo Police Chief Mike Douglas, Columbia Police Chief Jerry Paul, Monroe County Sheriff Neal Rohlfing, Community Outreach Pastor at Hope Christian Church Josh Boyer, Senior Pastor at LifeChurchX Matt Heck, Dr. Amy Rohlfing and Regional Superintendent of Schools Kelton Davis. King, Brafford, Hoeffken and Hitzemann serve as elected co-chairs of this new task force. Hitzemann also said he supported the task force’s work because many people in prison do not receive treatment for their problems and break the law again after their release. He cited examples of people he has seen sentenced to prison since he was elected in 2016 who have been released only to end up in the county jail on similar charges. “We’re hoping the efforts of this task force can help identify those who need help and break that chain,” Hitzemann said. At its first meeting, the task force began defining its focus and priorities. For now, any programs the task force implements will be restricted to residents of Monroe County only, due to factors like the treatment options available in the county. “I think there are plenty of people inside the county that need this intervention and this type of services,” King said. Task force members spent much of the meeting brainstorming potential ideas to help these people, but most of them were in the earliest of stages. So, the task force focused on more concrete priority areas. It discussed the possibility of providing every police officer, corrections officers and EMS personnel in Crisis Intervention Team training. CIT is a program that connects first responders with other community services to benefit those with mental disorders or addiction problems and increase officer safety. “So we can work better together and we’re not fighting each other because we all have that training,” Hoeffken summarized. All Columbia Police Department officers already have that training, but Paul suggested the task force investigate training a trainer so it can be provided locally. Related to CIT, the task force discussed plans to train people in mental health first aid, an eight-hour course that teaches individuals how to identify, understand and respond to signs of mental illnesses and substance use disorders. King is currently the only instructor in the county, but another one will be trained in the first week of November. Brafford has already taken the course and spoke highly of it. Davis also suggested the program be offered to educators and administrators in the county, which seemed possible. The final idea discussed was to facilitate a better process for when someone with a mental illness or substance abuse disorder is released from jail. Currently, people discharged from the jail are given information about where to seek help. The task force discussed scheduling an appointment at HSS for those leaving the jail shortly after their discharge and overall starting services earlier as possible solutions.